American House Spider: Adult female body about 1/3 inch long – males smaller. The almost globular abdomen is brownish with dark and light streaks and patches. This is one of many species that weaves irregular webs known as cobwebs. Web sites are chosen at random and if a web does not catch enough prey (mostly flies), it is abandoned and the spider builds another web. Most dirty cobwebs seen indoors are abandoned webs. After mating, the female lays about 250 eggs in a silken sac about 1/4 inch long, which is placed near the web center. The eggs hatch into spiderlings in about 8 days and several egg sacs are produced each year. 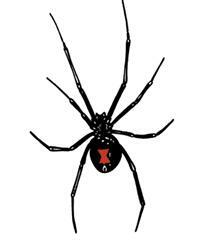 Black Widow Spider: Adult female body about 1/2 inch long – males smaller. Color variable but commonly black with red hourglass mark on underside. Weaves cobwebs and, like the house spider, occurs throughout U.S.A. , but more commonly in South and Southwest. They build webs in and around homes, often under objects. Females rarely leave the web, spending most daylight time in a silk tunnel near the center waiting for prey. Adult males do not attack prey or bite, but wander in search of females, often mating several times and sometimes being killed by mate. After mating, the female lays about 400 eggs in a silk sac and several egg sacs are produced each year. Eggs hatch in 8-10 days and the spiderlings disperse within a few days, living independently and reaching maturity in about 3 months. Adult females can live over 1 year. Black widow venom contains powerful neurotoxins which can cause several pain at the site of the bite and elsewhere. 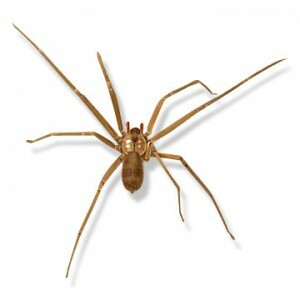 Brown Recluse Spider: Yellowish to dark brown, with longish body and legs. Adult female body about 1/2 inch long. Mostly found in the South and Midwest , this is the most venomous of many related brown spiders, all of which have a dark brown fiddle shaped mark on their backs. They wander around at night hunting insects, usually taking prey back to a web spun in a quiet location, such as attics or closets. They also hide in shoes, trousers and other clothing. Adults and young of both sexes are venomous and will bite if disturbed. Bites may cause severe pain and disfiguring scars. Females produce 1 to 5 egg sacs, each containing about 50 eggs, and may live over 4 years. What Can You Do Against Spiders? In many cases the presence of a few spiders is not a problem and requires no specific action. For instance, the spiders known as orb weavers, which spin wheel-shaped webs, are not dangerous to people and almost always live outdoors. Indeed, they may be useful in controlling garden pests. Likewise, a few spiders indoors is usually no problem if they are not dangerous species. However, a lot of spiders can be a serious nuisance because of the unsightly webs and because of spots of spider excrement on windows, drapes, or more valuable items, such as paintings. Where highly poisonous spiders are present, particularly if there are young, sick or elderly people in the home who are often more vulnerable to spider venom, specific action against spiders is recommended. Since spiders are predators, which feed mostly on insects, a homeowner’s main focus should be on discouraging spiders’ prey. Here are 10 measures you can take against spiders. 1. Trim back or remove bushes, weeds and grass around foundation to discourage insect and spider activity. 2. Remove outdoor cover favored by black widows and brown recluse spiders, including loose bark, logs, old bricks and concrete blocks, and other seldom disturbed debris. Move woodpiles away from the house. 3. Check patio furniture, firewood, cut flowers and other items prior to bringing them indoors and remove any “hitchhiking” pests. 4. Eliminate exterior lighting close to the house, especially near doorways, or use lamps which have minimal attractancy to insects. 5. Screen windows and vents, caulk exterior crevices and weatherstrip doors to reduce entry by spiders or their prey. 6. Eliminate clutter in closets, attics, basements, garages, etc. and dispose of old boxes, unused clothing etc. to reduce indoor cover for pests. 7. Regularly clean sinks and drains to discourage breeding of certain flies which spiders thrive upon. 8. Vacuum regularly around windows, doorways, corners of rooms, under shelving and furniture, and behind mirrors and pictures. 9. Ensure adequate ventilation in attics, basements, crawl spaces and other areas, since excessive humidity encourages the pests upon which spiders prey. 10. In areas where highly venomous spiders are common, check shoes and clothes left out overnight and particularly any work clothes left in a garage, before putting them on. 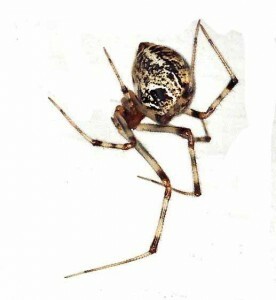 Many bites from brown recluse spiders result from spiders in clothing. NOTE: Wear thick gloves, coveralls and stout shoes when handling firewood, clearing debris, etc; in areas suspected of harboring dangerous spiders. 1. There are about 35,000 known species of spiders in the world and in most states in the U.S. there are at least 400 species. 2. Spiders are related to ticks, mites and scorpions, and like them have four pairs of legs, and no antennae or wings. 3. Spiders are predators, mostly feeding on insects and other small creatures, including other spiders, but able to go without food for long periods. 4. Almost all species have poison fangs which they use to inject venom which kills or paralyzes their prey. 5. Spiders cannot swallow solid food. Instead, after immobilizing their prey, they inject saliva containing protein-splitting enzymes, and after an hour or so the resulting liquidized interior is sucked out, leaving a dry husk. 6. Spiders, along with snakes, are among the most commonly feared creatures. This fear may be inherited rather than learned and is shared by some other primates, including chimpanzees. 7. Most spiders are harmless because their fangs cannot penetrate human skin or because they have weak venom or none at all. Most species of tarantulas are capable of causing painful bites, but they are not aggressive and are commonly kept as pets. 8. Only one type of spider in the world is aggressive. This is the funnel web spider of Australia , which attacks people without provocation and is highly poisonous. 9. In the U.S.A. , the most poisonous spiders are the brown recluse and black widow spiders. These are mostly shy, but will bite if provoked and can cause severe injury or even death. 10. Spiders produce silk, which they use to make egg sacs, shelters for themselves, or traps and webs for catching prey. The gossamer threads produced by young spiderlings enable them to be dispersed by the wind, sometimes traveling hundreds of miles. If you’re interested in the Spider Pest Control Service offered by Termite Terry please feel free to call us at 949-631-7348 in order to set up an appointment or use our online Order Form and we’ll get back to you as soon as possible.